Stocks moved higher Friday following two days of losses, but investors remained relatively cautious on the fourth day of the government shutdown. The Dow Jones industrial average, the S&P 500 and the Nasdaq advanced between 0.5% and 0.9%. The gains came at the end of what was a mostly down week on Wall Street. 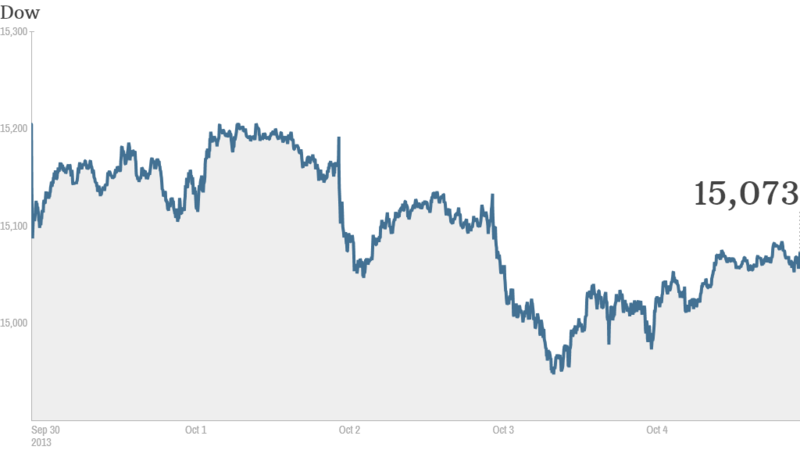 The Dow fell 1.2% and the S&P 500 slipped 0.1%. Friday's move higher helped the Nasdaq book a 0.7% gain for the week though. The government shutdown has created plenty of uncertainty and left an estimated 800,000 federal employees waiting to go back to work. The shutdown is also delaying the release of the government's monthly jobs report, originally scheduled to come out Friday morning. Since the recession, the report has become the most closely watched indicator on the economy. With little else to focus on, investors will continue to watch Washington for developments on the budget deal and the looming deadline to raise the debt ceiling. Failure to raise the debt limit is likely to have a significant impact on the global economy, as well as stocks, bonds and currency markets. Though the political gridlock has sparked volatility on Wall Street, some experts say it is also creating bargains in the stock market. "Think of this period of uncertainty as a buying opportunity for investors who are under-allocated to equities and have a long time horizon," said Kristina Hooper, head of investment and client strategies at Allianz Global Investors. She noted that although stocks plummeted in 2011 in the aftermath of an ugly debt ceiling debate and subsequent credit downgrade, they recovered and continued to rally. Plus, it's unlikely the Federal Reserve is going to cut back on stimulus anytime soon, especially if the shutdown lingers and the country defaults on its debt. The last thing the Fed wants to do is scale back, or taper, its $85 billion per month in bond purchases at a time that could send the market into a tailspin, Hooper said. What's moving: Shares of Facebook (FB) moved higher after the company said it will start selling advertising on its photo sharing tool Instagram. While ads might be bothersome for users, investors were excited about how they might boost Facebook's revenue and bottom line. "$FB Instagram monetization means all analysts estimates and price targets are WAY low, add about $8-$10 + to EVERY current price target," said StockTwits user TeslaMan. Facebook competitor Twitter made its IPO filing public late Thursday. 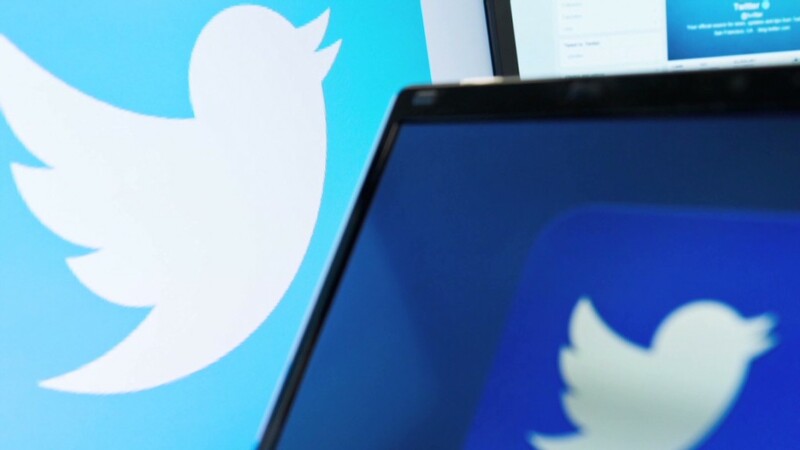 Twitter revealed that it is still unprofitable. The company also said it will trade under the symbol TWTR, though it hasn't yet said on which exchange it will list. Goldman Sachs (GS) is the lead underwriter for the IPO. As investors await Twitter's public debut, some investors drove the stock of a bankrupt electronic retailer higher. Tweeter Home Entertainment Group (TWTRQ) shares soared nearly 700% Friday on heavy volume. The company, which still trades at only 5 cents a share, filed for bankruptcy in 2007 and went out of business in 2008. But investors may have mistaken it for Twitter since Tweeter's symbol is TWTRQ. StockTwits users were quick to notice the difference. "Twitter Look-Alike Ticker Triggers 684% Advance in Penny Stock," said AlephBlog. "Big difference btw Twitter $TWTR & Tweeter $TWTRQ $$." Though Twitter's IPO is the most highly anticipated market debut since Facebook, investors were salivating over the IPO of a Chicago-based sandwich shop Friday. Potbelly (PBPB) surged 120% from its offering price as it began trading on the Nasdaq. But StockTwits users didn't seem to get the hype. "$PBPB I don't get it. Has anyone eaten here?," asked StalkinStocks. "It's really not very good... I went once and have no desire to go back. Looking for puts." Even those who enjoy the sandwiches were skeptical. "$PBPB Good lord," said tickertutor. "Their sandwiches are good, but I would have never expected this the first day out." Tesla (TSLA) shares were higher following a three-day slide that shaved more than 10% of the value off the electric car maker's high-flying stock. The stock really took off at the end of the day after CEO Elon Musk published a blog post explaining what happened with a Model S that crashed earlier in the week. Images of the car in flames led some traders to wonder if Tesla's reputation as a maker of safe cars would be at risk. But some investors simply wonder if the stock has run up too far too fast. Shares of Tesla have climbed more than 400% this year, and are trading at 100 times 2014 earnings estimates. Tesla bears may question its lofty valuation, but StockTwits user never2long said that fans of the stock aren't going to be deterred by a high P/E ratio : "$TSLA It's foolish to think that TSLA isn't overvalued, but it's also foolish to think the market cares." Shares of J.C. Penney (JCP) continued to take a beating. The stock price of the troubled retailer fell below $8, its lowest since 1982.